Fernando Torres scored twice to help Liverpool overpower Benfica at Anfield and set up an Europa League semi-final clash with Atletico Madrid. The Reds levelled the tie on aggregate when Dirk Kuyt met Steven Gerrard's corner and his header was allowed to stand after initially being ruled out. Lucas ran clear to make it 2-0 before Torres added a third on the break. Oscar Cardozo's drilled free-kick gave Benfica hope but Torres made sure of victory late on with a cool finish. The Spanish striker can look forward to returning to his former club Atletico in the last four after keeping alive Liverpool's last hope of silverware this season but, in the meantime, his side will resume their bid to secure fourth place in the Premier League with added confidence after an impressive display. 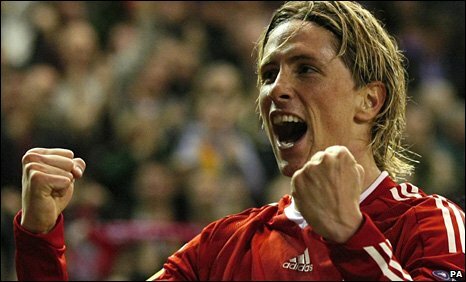 Torres's eventual contribution more than justified Rafael Benitez's decision to replace him during Sunday's 1-1 draw with Birmingham to rest a knee injury, but initially he appeared to be struggling against the Portuguese champions and was in some discomfort. Fulham produced a superb second-leg display to beat German champions Wolfsburg and seal their place in the Europa League semi-finals. The Cottagers took 21 seconds to make amends for Wolfsburg's late goal in the first leg as Bobby Zamora neatly turned Jan Simunek and slotted his side ahead. Grafite saw a shot blocked on the line as the home side pressed late on but Fulham held out for a deserved win. They now face Hamburg in what is their first ever European semi-final. The success continues a sensational second European campaign for Fulham, who had eliminated defending champions Shakhtar Donetsk and favourites Juventus in the previous two rounds. It is a fitting reward for an extremely determined and intelligent performance from the London side, who struck with their first attack and then frustrated their talented opponents. Wolfsburg came into the game full of confidence following Alexander Madlung's late header in the first leg, which had given them a priceless away goal and a strong foothold in the tie. Fulham were punished for a poor final 10 minutes at Craven Cottage last Thursday but it took them all of 21 seconds in the Volkswagen Arena to rectify the previous week's last-ditch lapse in concentration as Zamora gave them the lead straight from the kick-off. The in-form striker, who passed a fitness test before the game on an Achilles injury, collected a pass inside the area from fellow forward Zoltan Gera and stylishly set up a cool, side-foot finish past home keeper Diego Benaglio for his sixth Europa League goal of the season and 19th in total.